Creating an Audit Policy will not automatically begin Auditing all actions taken within FIMS. Tables must be added to the Audit Policy so FIMS knows which areas of the program you want it to audit. NOTE: You may have as many tables in a policy as needed. The recommendation is to have a single policy for each module to make it easier to manage. However, adding additional tables to a single policy might be necessary to capture all the changes required for the project. Click Add Record on the Table Toolbar. Click the Search button in the Table Name field to choose the table for inclusion in the policy. Do Not Audit This Table (Off) – If you choose this option, no auditing is done for the table. Audit Tables but do not store initial values (Min) – Records the event that took place, but does not save the values related to the event. Audit Tables and store initial values (Std) – Records the event that took place, along with the original values. Audit Table and store old and new values (Full) – Records the event that took place, along with both the original values and the updated values. This option is only available for Update level. In the Event ID fields, leave the default values. (These are the most commonly used events). Save the record by clicking the Save icon on the tool bar. 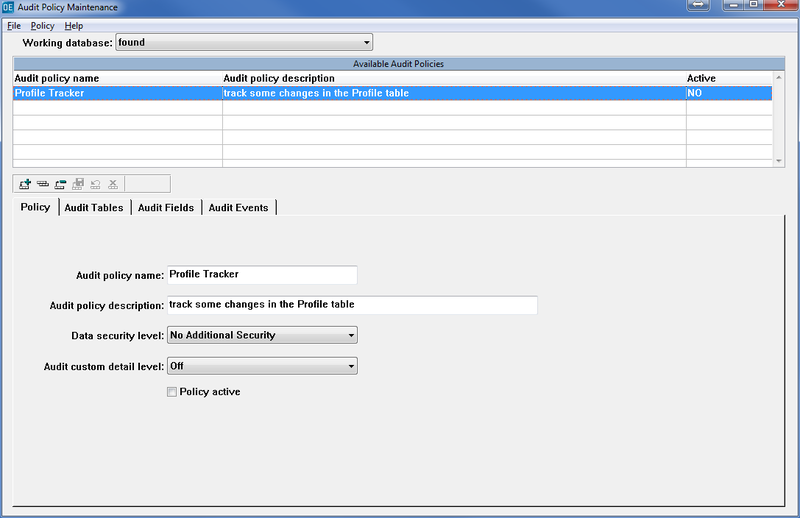 If you want to track field changes in this audit policy, they must be added on the Audit Fields tab. Once the table and field selection is complete, Audit Events will need to be added to the policy to delegate creation, update, or deletion of audit records. Finally, the changes will need to be committed for this Audit Policy to fully take effect.